It’s Global Youth Traffic Safety Month and National Bike Month. What can you do to make your streets safer for all users, not just those driving cars? Can traffic calming help? Traffic calming can take the form of physical devices such as speed humps, cushions, and curbing or it can involve visual changes such as speed display signs and variable message signs. It’s used to slow cars down and return safety to local roads. But does it work? Not only does traffic calming improve safety and reduce speeds, it prevents crashes every day. A thorough report on speed sign effectiveness in a wide variety of settings found encouraging data regarding radar speed sign use. Some states saw reductions in the percentage of speeding drivers by as much as 25%. Average speed reductions of 10% were seen on local roads while work zones and school zones saw reduced speeds and increased awareness. Traffic studies, such as this one by the FHWA, and this one by the American Journal of Public Health, found that speeds are consistently reduced and safety is increased with the use of physical devices such as speed humps and tables. 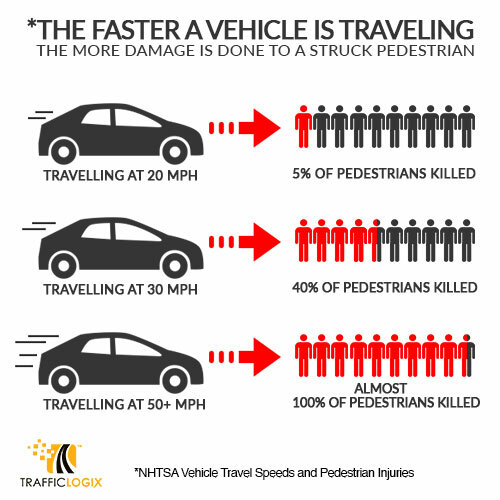 What is harder to quantify, but just as worth noting, is how many injuries and fatalities are avoided when speeds are reduced, as evidenced in this infographic. Actively engaging in speed reduction efforts on your streets by using speed trailers, radar signs, or speed humps or cushions, can make a big difference in creating complete streets that are responsive to everyone’s needs.